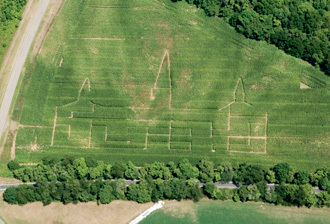 Do you detect a familiar outline in this Kenyon corn maze just south of Route 229? English professor Sergei Lobanov-Rostovsky dreamed up the Old Kenyon labyrinth for the new preorientation Program in Writing and Thinking held during ten days in August. The maze was designed by math professor Judy Holdener and Ziyue Guo '10 and carved by farmer Tim Norris with the assistance of several students.